Bolle is a French family owned business and one of the only manufactures of safety glasses to continue to research and develop in the field of safety eyewear. 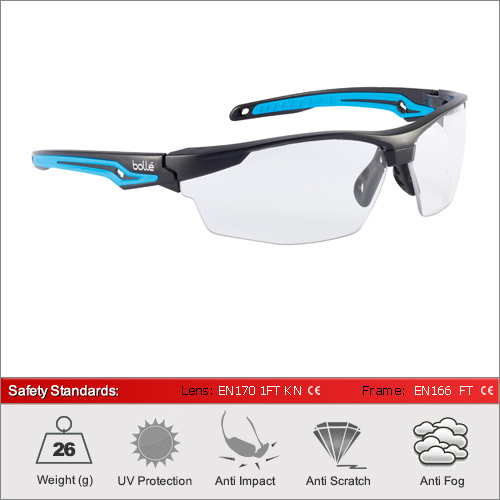 All their glasses are optical quality 1 and exceed all the industry safety standards. 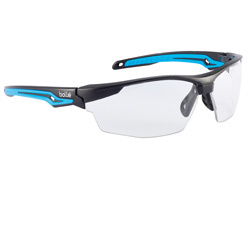 The Tryon is an exciting new design of sporty safety glasses and available in four lens types. Light weight and high quality safety spectacles. They boast Optical Quality 1 lenses with anti-scratch and anti-fogging surface and a non-slip nose bridge including the flexible temples. Due to the nature of the special Flash lens treatments, they are only have anti-scratch and anti-fogging coatings on the inside of the lens. Great protection from UVA and UVB rays which go from 280nm of light. We have 4 lenses available in this frame. The clear lens for 100% optical quality 1 performance. The Smoke lens for direct sunlight and other bright light conditions. CSP for working in low and bright lights conditions in extreme temperatures and finally the Flash lens for full solar protection and heat deflection. For a full explanation of the different lens types and their ideal usage please see our dedicated Lens Advice Section. Here we have summarised the main safety standards for the frame and each lens type. After each are their specific safety markings (i.e. 2-1.2 1F). To interpret these and understand the full specifications of each pair, please see our dedicated Standards Advice Section.